Workforce Unlimited Premier Division: Coningsby v Old Leake (G. Hurst), Leverton v Billinghay (R. Holland), Pointon v Benington (T. Sharrock). Workforce Unlimited Premier Division (KO 6.45pm): Spilsby Town v Railway Athletic (L. Crawford), Skegness Town Reserves v Swineshead Institute (P. Hindle - KO 7.30pm). 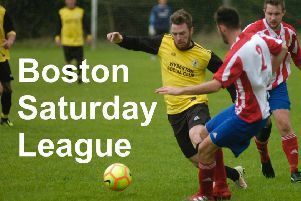 Workforce Unlimited Premier Division (KO 6.45pm): Benington v Coningsby (S. Lea). Kirton Cup, final (KO 6.15pm), at Graves Park: Kirton Town v Pointon (J. Hudson, M. Bruntlett, N. Andersen).